Like you said, the split peas is really easy to overflow!! I am extremely bad at cooking, but your instrutions and tips are really helpful!! You're welcome. Just share some of my experience. How is your dessert going? It came out really well. It was a bit firm and drier than I expect - to resolve, I "dressed" it with some evaporated milk and then everybody loves it. What could have caused the dryness? Hmmmm...It's interesting. I've never encountered such a problem you mentioned here before. If you followed through the steps and didn't miss anything, it could be the cornflour you used. Different brands would produce different results.The cornflour is the key element to determine the toughness of the dessert. 我最近都遇到這問題, 原來在美國 cornflour 即是 cornstarch 呢! 明確了後, 做出來的馬豆糕很好吃啊! Thank you for sharing the recipe. Was so happy how it turned out(taste and look)in the pot after the split peas were stirred in. 儘管如此,但還是失敗! I let the mixture cooled down before putting it in the mold, and it turned very lumpy. I reheat the pot but was to late (worried I might burn the mixture while reheating it). Did not make a smooth 香滑的椰汁馬豆糕! Oh dear! What a distressing experience you had. Yeah, my pudding was very smooth, shown in the picture. Did you stir constantly after adding the cornflour? Your stirring would break down the lumps while cooking. 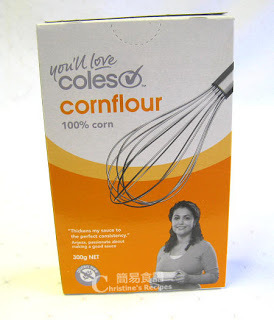 Moreover, cornflour won’t stick together very much like other kinds of flour. When your batter was cooked and thickened, cooked enough time, the best way was to transfer into the mold when it’s still hot. The batter would be a bit wobble when it's still hot. After completely cooling down, chill in the fridge, the pudding would be set and becomes firmer. Can I use coconut milk instead of coconut cream?? 因剛沒有粟分, 以生粉取代, 但弄出來唔企身, 切唔到一件件, 但味道好好! I had my first 馬豆糕 in a dimsum place years ago and have been in love with it ever since. Like you, I don't like those with too much coconut flavor. So glad to see your recipe and will try it soon. ^_^ Thanks for sharing! 3. 如想椰汁味濃一點, 可否加多些椰漿? 如可以, 要否增加粟粉份量? - "2. 用 1杯水，把粟粉調勻。" 用熱既熟水嗎? I am so happy that my sister-in-law found this link for me to make the split pea and coconut cream pudding. I used to love this dessert a lot when I was living in HK. Now I can look up your site for all the other wonderful Chinese recipes that I look forward to try. Thanks a lot for your sharing. You are wonderful. Thinking about using "Evaporate Milk with coconut favour" Carnation Brand instead of real 椰汁 for diabetes. Shall I use the same quantity? total of 2/3 + 1/2 cup of Carnation coconut favour eva milk, thanks. Basically, you could replace the coconut milk with any kind of milk you like. The amount will vary that depends on how thick the milk is. As coconut cream is a bit thicker, so you might need to have a bit of experiment to make the batter with the right consistency. 請問你有冇甜品食譜係用 Carnation coconut evaporated milk. 我有兩礶在櫥櫃內很久, 但找不到食譜, 唔知點算好, 請幫幫忙. 椰漿（椰奶 coconut cream） 2/3杯,花奶 (evaporated milk) 1/2杯 ,等於多少毫升?